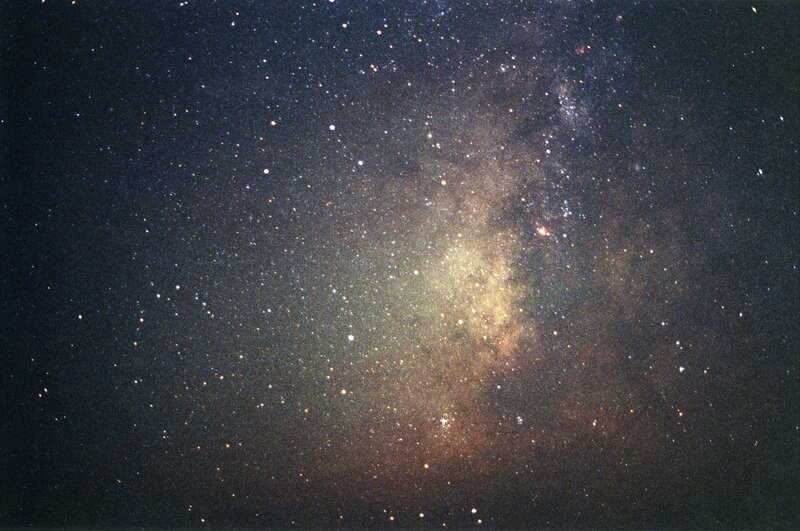 The upside-down Little Milk Dipper of Sagittarius (the Archer) dominates the upper center of the photograph, its handle sticking into the Milky Way. From left to right they are Ascella, Tau, Nunki, Phi, and Kaus Borealis. The main part of Sagittarius' "bow" starts at the end of the Little Milk Dipper's handle and bends down and to the left (from top to bottom, Kaus Borealis, Kaus Media, and Kaus Australis). The bow then bends up and to the right to Polis. Just below Kaus Australis is reddish Eta Sagitarii. Rukbat is down and to the left, while Arkab is the double closer to the lower left corner. The arrow runs from the center of the bow down and to the right to the star Alnasl (with W Sgr just up and to the right), and points close to the center of the Galaxy in the dark clouds of the Milky Way, seen running from upper right to lower center. X Sgr is directly to the right of Alnasl and just above the Galactic Center. Albaldah is the bright star at the top center edge. The bow, arrow, and the Little Milk Dipper together make "the "Teapot." The cluster M 7 in Scorpius is seen just to the right of bottom center; Scorpius's two-star "Stinger" is just to the right of center at the bottom edge. The small reddish spot toward left center is the Lagoon Nebula, M 8, which lies below Polis and just to the left of the Winter Solstice. Down and to the left of the Little Milk Dipper lies the semi-circle of Corona Australis, the Southern Crown. The brightest of the string of four stars near the lower left corner is Theta Ophiuchi. For more on Sagittarius, see Tea With the Scorpion at Stellar Stories. See Sagittarius from Bayer's Uranometria of 1603. See the wide field of constellations around Sagittarius. 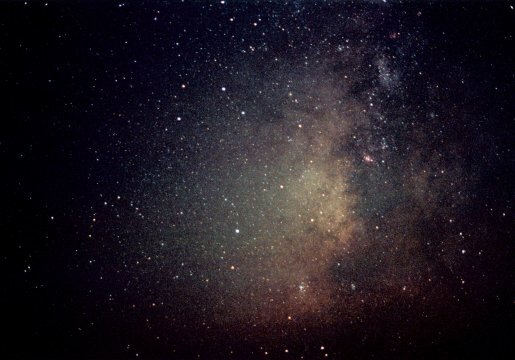 See the Milky Way from Scutum to northern Sagittarius.